It turns out that there is no single best approach for drawing edges, rather many possible ways of working. In the class, each artist took a picture by a “great master”, from Leonardo da Vinci to Henry Moore, discussed how edges had been tackled in that picture, and attempted to apply these methods to still life drawing. This meant that people attending the workshop drew in completely different ways from one another, and several media were used from red chalk to ink line and wash. I had come up with a long list of possible edge strategies. There was plenty to discuss at the workshop, lengthy notes to take home, and I have probably only scratched the surface of this subject. Out of the great master drawings that we analysed, one of my favourites is Rembrandt’s black chalk drawing entitled “An Elephant”, from 1637. This is in my rather battered but beloved copy of “Rembrandt as a Draughtsman” by Otto Benesch, which I had bought from a library sale for the measly sum of 30p. The orginal drawing is 233 x 356mm. This elephant study is remarkable in that it shows the bulk, roundness, and shifting weight of the massive creature completely convincingly, while not attempting to create a total illusion of reality. The red arrow points to the outer edge of the slipper (some artists use the term contour to describe the outer edge). 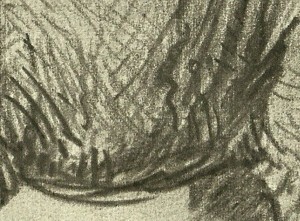 As the opening of the slipper curves inwards, the light falls on some surfaces more than others, creating internal edges (“lines” of tonal contrast). I have marked two of these with blue arrows. Well, we could argue whether or not to call them edges, as their appearance is dependent on how the light falls, and indeed they merge into the curved surface of the slipper. If I were sketching the slipper in pen, I might be tempted to indicate some of these internal edges by using lines. 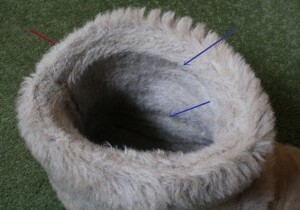 The inside of the soft slipper, with various curves merging into one another, can be seen as similar to the rounded elephant. 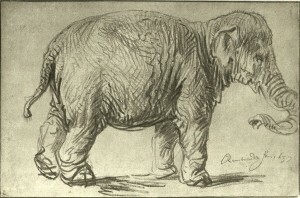 One of Rembrandt’s aims in drawing the elephant was to show how curved or rounded its body was. For example, its belly is not a sphere, but is rounder low down and further back (due to the great weight of its contents) and relatively flat high up where it drapes over the spine. Rembrandt achieved this by combining outer edge lines with cross-contour lines. The latter are lines that appear to curve around the surface of the elephant. Look at these cross-contour lines around the elephant’s trunk. I have marked them with purple arrows. There is some kind of edge line (made up of many gestural marks) all around this elephant. 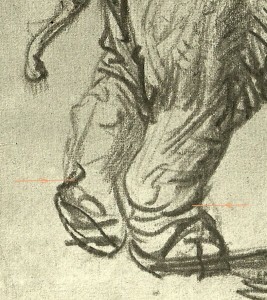 In some places these outer edge lines are very heavy, to suggest parts of the body in shadow, but also to emphasise the weight of the elephant hanging down. The underside of the animal’s belly is represented by weighty charcoal edge lines which merge into heavy cross-contour lines. Now see how Rembrandt handled the stomping back feet of the animal. 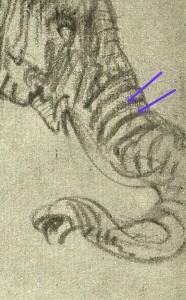 There are curved, tapered charcoal marks (I’ve marked them with orange lines) here that suggest an outer edge leading into a cross-contour line but also somehow suggest the energetic lift and stomp of the feet. 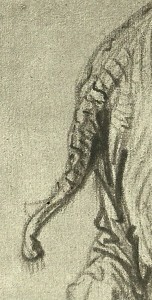 I would perhaps not have quite enough information from this sketch with which to sculpt the hind feet of this creature but, in a few charcoal marks, Rembrandt has hinted at their roundness, weight and movement. Look at the information Rembrandt gives us about the tail. He combined edge lines and cross contour lines to suggest that it is not plump, but is wrinkled, creased and rather knobbly. 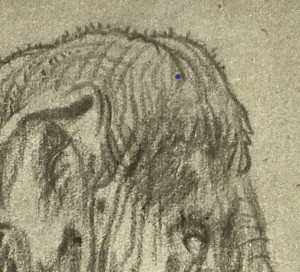 There are even little hairs suggested on the top of the elephant’s head and on the end of its tail. Rembrandt’s elephant drawing tells me what it might be like to stand next to, and to touch, the real animal. This is not a photo-realistic image but, in a few varied charcoal marks, Rembrandt has given me more information than a photograph.